Happy Friday folks! Weekend is here and i am glad of some down time, let me tell you! My friday has been super lovely so far. My lovely sis came down with fabric from her store and i have dabbled in cushion cover making. It’s been fab… although i’m definitely not a natural at sewing ( i stabbed my thumb on a pin and bled everywhere:(!!) But as a first attempt they came out pretty sweet!Posted pics on instagram(of which i’m totally addicted!) are you on there? Would love to follow, let me know your user name in the comments! Today we also went for an appointment at a local crèche for Neo. It was amazing, i’m so excited for him to start and be around other kids and have hands on activities, more so than i can provide for him at home (ie, sand and water play, huge outdoor facilities etc) he was in his element and didn’t want to leave. So fingers crossed he’s gunna love it there. Anyways, outfit wise i fancied Friday as a casual day. The thing is i wear frocks and skirts probably 85% of the week, so i do like a bit of down time in some jeans and a simple outfit. Then my brain goes into overload and thinks “is this boring, to simple?” But then i think perhaps i’m over thinking it. I read that Kendie has the same issues sometimes… less can be ok, right? Am i over thinking things here? Let me tell you, i LOVE these shoes. No wearing in needed. Popped them on today for the first time and they are lovely and soft and comfy. What a pleasure to wear. I’m looking to wear them with tights and a dress possibly soon. This evening i’m off to see my lovely friend Charlie and she’s cooking me tea! Yum!! Have yourselves a lovely weekend chickies and i will see you soon!! Ps.. if you haven’t yet, would love if you could click this link and “like” my photo… So far i’m in second place!! Fingers crossed!!! 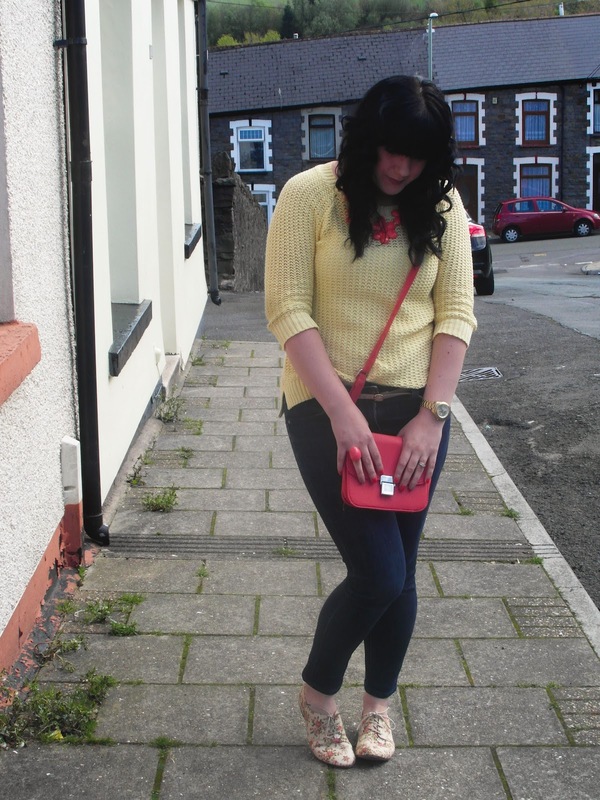 I love the colour combo & brogues! 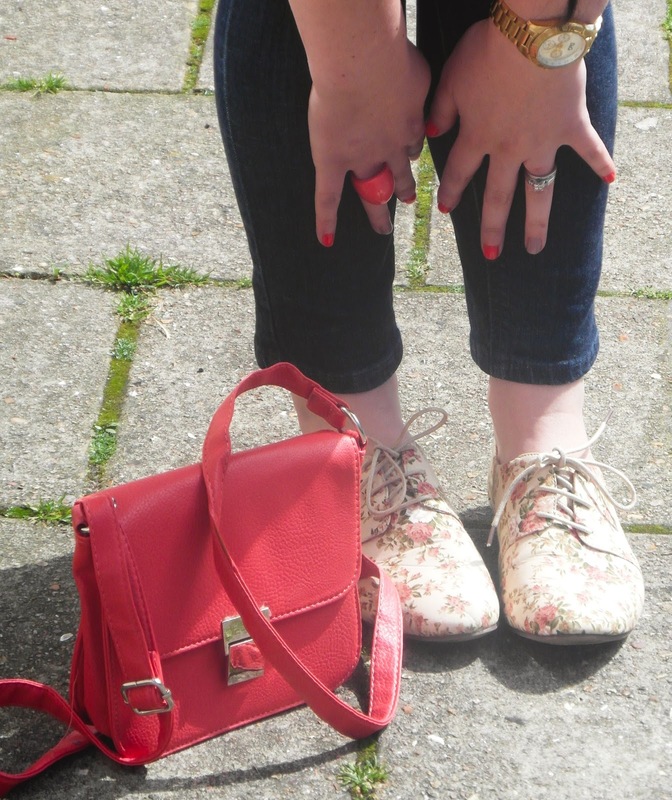 I never used to like brogues at all, but my mind seems to have changed recently! i think i must have said it 2 or 3 times already today, but i'll say it again. i hope you have a wonderful weekend!!! Aw, aw, aw! 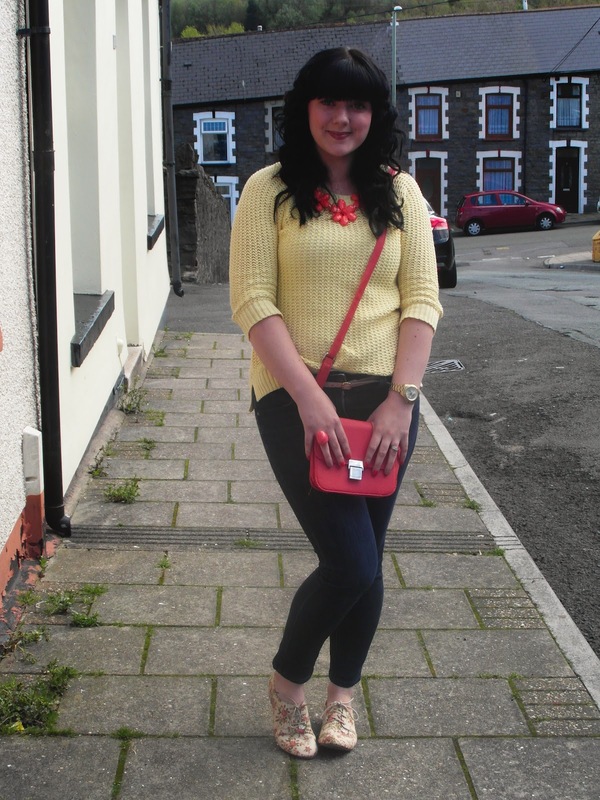 I adore that coral necklace! I'm trying to find a coral color statement necklace, but haven't found any. I have a similar one in white though. Thanks for visiting my blog, and please stop by again soon! 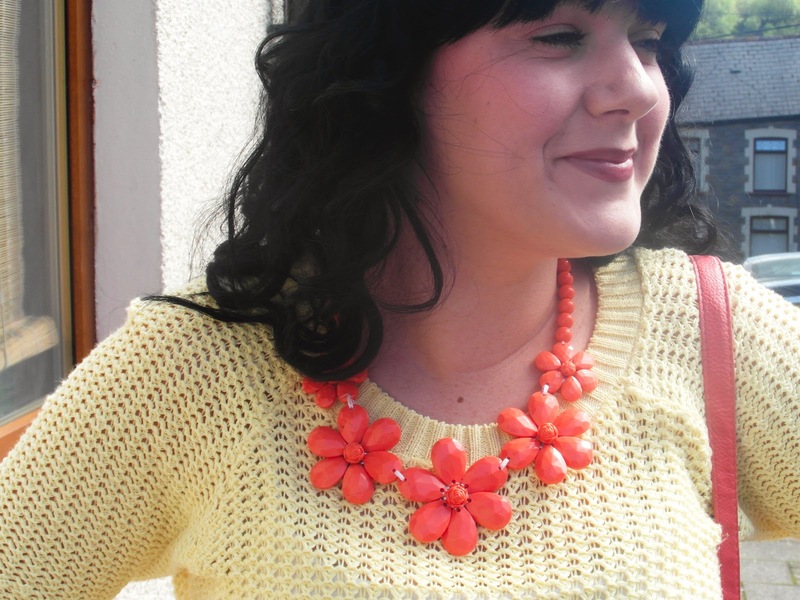 Love the lemon and coral together – looks so Summery! 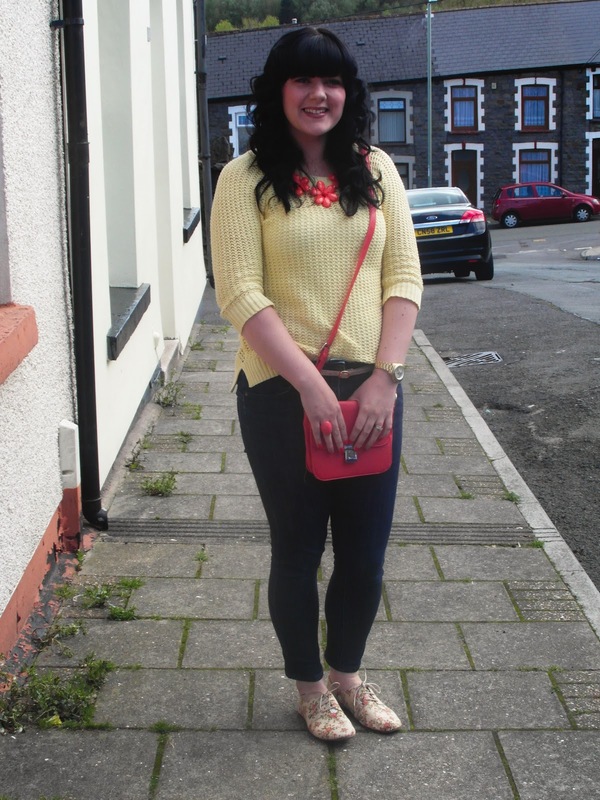 Just to let you know I have awarded you the 'Sunshine Award' – deets on my blog, hope you like it! What a lovely smmery combination! I'll be honest I would haver have thought about putting those two colours together but they work really well! Ooh I love your jumper, go Tesco!